As general manager of Luther Bloomington Hyundai in Bloomington, Minn., Checheris says customer service is at the forefront of everything the dealership does, from its complimentary showroom snacks to text-message service appointments to its instant-answers live chat. 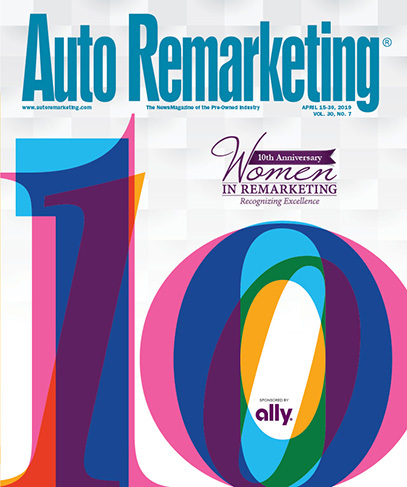 “We all really work hard at the same goal — to meet guests’ needs,” Checheris told Auto Remarketing earlier this month. “It’s such an efficient market today, and customers have so much at their fingertips when buying a car. They want to be sure they’re buying from someone who knows what they’re selling, and we recognize that. The auto group was founded in 1946 by Rudy Luther, with one Pontiac dealership that he grew to eight stores by the time of his retirement. His son, David Luther, is now president of Luther Automotive Group which has grown to 28 stores spanning Minnesota, Wisconsin and North Dakota. That count will soon rise to 30 as the group adds a Volkswagen and another Hyundai rooftop in Minnesota. Checheris credits David Luther for the growth of the company, and for instilling a culture of customer service throughout. Luther often reminds the team that shoppers are indeed invited guests at the dealership, Checheris said. The idea apparently works: Checheris’ store, which opened in the Twin Cities as a Hyundai-exclusive dealership in January of this year following a partnership with Kia and Mitsubishi, has seen its service department honored the past two quarters with the Hyundai banner for having the highest CSI (Customer Satisfaction Inedex) for a rolling three-month average among dealerships in the district. He credits its location on American Boulevard, one of Minnesota’s busiest stretches of highway, for the growth of his store. More importantly, he credits staff for embracing CPO, which Checheris has said offers F&I gross profit about 20 percent higher than non-certified vehicles. “We’re really trying to get traction on CPO,” Checheris said. “It ultimately creates an awareness of, one, Hyundai, and two, opportunities to get units in operation for us in the service department. Hyundai won the Best Popular CPO Program Award in IntelliChoice.com's 2013 Certified Pre-Owned Awards, which were announced at Used Car Week on Wednesday. Hyundai has now won this honor two years in a row. While inventory has been tight for pre-owned vehicles this year, Checheris said his store procures the majority of its used vehicles through trade-ins, the service department and Hyundai-focused auctions. He expects used sales numbers to rise for 2013, thanks to a good incoming flow of lease returns as Hyundai embraces leasing. A warranty is offered for every vehicle on the Luther Bloomington Hyundai lot, whether a Hyundai or not, Checheris said, and the company offers a five-day return or exchange policy on all vehicles, both new and used. A veteran of the auto industry, Checheris began his career at a Chevrolet store in 1984 while a student at the University of Minnesota, studying business and marketing. He’s been with the Luther group for 22 years. Checheris also shared his thoughts with Auto Remarketing on the marketing and advertising of used vehicles in today’s fast-paced, mobile climate. “Being part of a large organization, we do a lot of branding and a pretty good job of driving people to the corporate website, LutherAuto.com. That way, they could be thinking of one car (make) then see another within the Luther family,” he said. While new-car advertising efforts by the Luther group include television, radio and digital avenues, pre-owned vehicle advertising is focused strictly on digital, Checheris said. That’s because used-car shoppers generally tend to go straight to the Internet for auto research, he says, especially those he calls “low funnel guests,” who have already focused their buying intentions on Hyundai. “We promote the dealership website to drive traffic. Everyone’s talking about Hyundai, with rapid growth the last few years, and we want Luther Bloomington to be top of mind when they want to buy,” Checheris said. Luther’s centralized IT department keeps specials — from new and used cars to parts, service and incentives — posted on the dealerships’ websites, which also offer trade values, instant quotes and pre-approvals, but the efforts go much further. While industry research from J.D. Power and Associates, Cars.com and others shows ongoing growth in the use of mobile devices by both new and used auto shoppers, Luther’s approach to mobile demand continues to strategically evolve, Checheris said, from texting, which works “extremely well” for service customers to following the latest technology trends. “Our IT department realizes that timing is of the essence,” in today’s business climate, Checheris said. “Brian Kenny is the IT director for the Luther Automotive Group, and is one of the best. He stays ahead of the curve ball, and he’s all about the guest experience, to help and engage them. He’s always asking the GMs, ‘How does this help our guests?’ That frame of reference slows us down to think. Live chat solutions are greatly impacting the Luther group, with much of the contact coming via third-party auto search sites. “We’re having tremendous success with chat,” Checheris said. “People are seeking information, wondering if a vehicle is available, or asking about condition. We try to establish relationships before they even get to the dealership. Checheris also knows that his allocation of advertising funds can be altered with each new solution to arrive on the market.